Recent research has shown that genetic predisposition plays a key role in the development of many mental health issues. 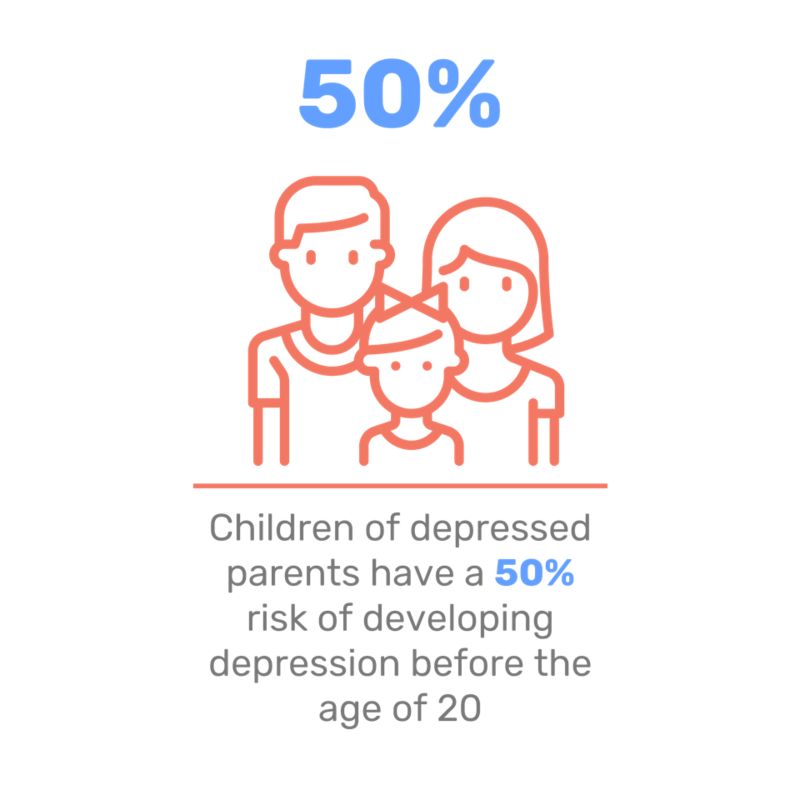 For instance, between one-third and two-thirds of children whose parents have mental health problems will go on to develop mental health problems themselvesFalkov, A. (1998). ‘Crossing bridges: training resources for working with mentally ill parents and their children’. Cited in Social Exclusion Unit. (2004). ‘Mental health and social exclusion’. [online] London: Office of the Deputy Prime Minister, p.75. Available at: http://firststeptrust.org.uk/wp-content/uploads/2012/11/mental_health_and_social_exclusion_main_report.pdf [accessed 9 Aug. 2017].. The role of genetics varies according to the mental health issue. For example, bipolar disorders have a relatively large genetic component, while environmental factors play a bigger role in the development of post-traumatic stress disorders. World Health Organisation. (2004). ‘Prevention of mental disorders: effective interventions and policy options’. [online] Geneva: World Health Organisation, p.29. Available at: http://www.who.int/mental_health/evidence/en/prevention_of_mental_disorders_sr.pdf [accessed 9 Aug. 2017]. Doctors can run various genetic tests to identify our predisposition to certain mental health issues. These tests involve taking samples of our blood or tissue, and looking for:NHS. (2016). ‘Genetics’. [online] Available at: https://www.nhs.uk/conditions/genetics/services/ [accecssed 3 Nov. 2017]. Genetic testing can also help to ascertain which treatments might be the most effective.Burke, E., Love, R., Jones, P., Fife, T. (2016). ‘Pharmacogenetic Testing: Application in Mental Health Prescribing’. Journal of the American Psychiatric Nurses Association, [online] 22(3). Available at: http://www.ncbi.nlm.nih.gov/pubmed/27009929 [accessed 3 Nov. 2017]. This field is in its early stages, but is making rapid progress. Often, genetic and environmental factors contribute together to mental health symptoms. This is due to the impact of epigenetics. ‘Epigenetics’ – literally, ‘on top of’ genetics – refers to the way our environment turns genes ‘on’ or ‘off’. Certain environmental triggers can override our gene expression, silencing a ‘bad’ gene or promoting a ‘good’ one. This is known as the ‘epigenetic effect’.Gottfried, S. (2013). The Hormone Cure. New York, NY: Scribner, p. 168. Though research is ongoing, it’s difficult to work out the precise ratio of genetic and environmental influences on mental health. Because of the effect of epigenetics, people who have genetic markers for mental health issues need to be especially careful about their lifestyle and environment.